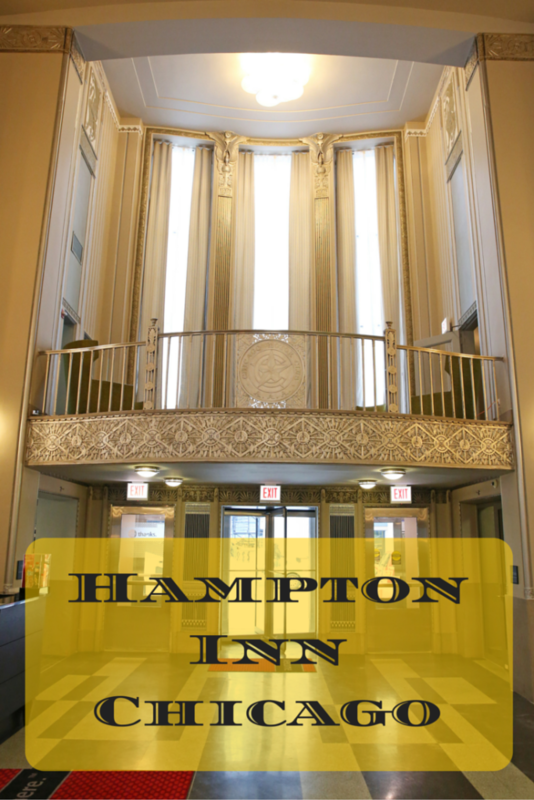 Photo courtesy of Kenny Kim Photography The Hampton Inn Chicago Michigan Avenue restored the original art deco design of its building, which used to be the Chicago Motor Club offices. Inside the new Hampton Inn Chicago Michigan Avenue, an acoustic guitarist plays during happy hour in the lobby bar. A 1928 Ford Model A car sits on a second-floor loft. 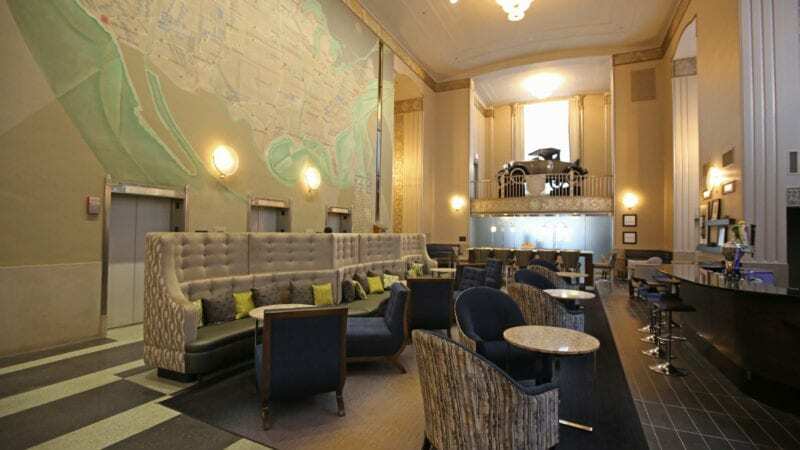 The decor feels Empire State Building-like, with original 1920s Art Deco fixtures, terrazzo floors and a wall mural over the ornate elevators – remnants from when the building housed the Chicago Motor Club. This is not your typical off-the-interstate Hampton Inn. The Hampton Inn Chicago Michigan Avenue restored the original art deco design of its building, which used to be the Chicago Motor Club offices. The Hampton Inn Chicago Michigan Avenue (opened in May 2015) may not have the familiar look of the other hotels in its chain, it still most of the features I love about Hampton Inns – clean rooms, freshly washed comforters, free WiFi, a big (free) breakfast, an updated gym, super nice staff, and reasonable prices. Hampton Inn is one of my go-to hotels when I travel with kids. Most have been recently remodeled, and they have family-friendly features like free WiFi and breakfast, an indoor pool, and reasonable prices. 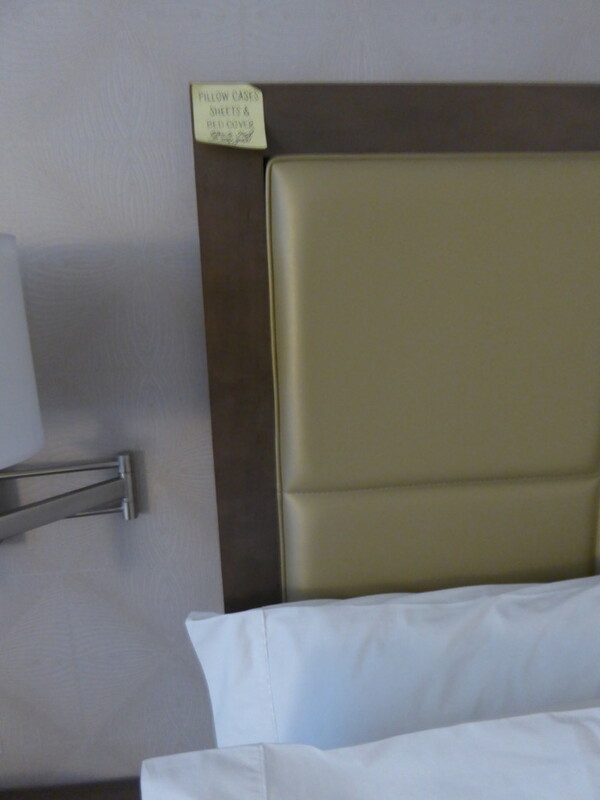 As in all Hampton Inns, a Post-It note on the bed reminds you that the comforter has been freshly washed at the Hampton Inn Chicago Michigan Avenue. 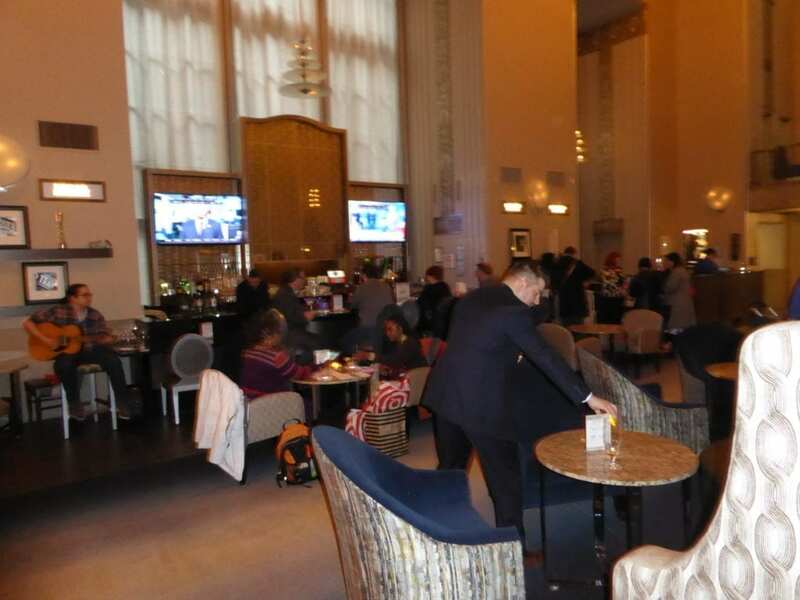 The hotel is in a fabulous location – in the heart of downtown Chicago, right along Michigan Avenue and the Chicago River. You can walk to Millennium Park, the Art Institute of Chicago or Water Tower Place shopping center. And you’re just two blocks from the “L” or the Wendella boat or water taxi. Everything in the room is new and clean. 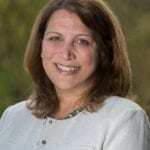 The hotel staff is extremely nice – they dealt with a minor hospitality issue we had immediately and apologetically, and when we requested extra pillows, they brought them in a snap, even though it was 11:30 p.m. The free WiFi is great, and so is the free breakfast – a buffet with things like orange juice, eggs, sausage, waffles, hot oatmeal and fresh fruit. For a family of four in downtown Chicago, that free breakfast is a significant value. The bathrooms are small but newly remodeled in the Hampton Inn Chicago Michigan Avenue. The rooms are small. That’s not the worst thing, because in a city like Chicago (and in a location like this), you don’t really spend much time in your room anyway. But our family of four (two adults and two tweens) felt squeezed in one room. There were two double beds (not queens), a tiny bathroom, and not much space for suitcases. I recommend families get two adjoining rooms. Unlike most Hampton Inns, there is no pool at this hotel. If you’re staying on a Wednesday night, beware of the 6 a.m. Thursday beeping garbage truck that slams down metal dumpsters in the alley. To avoid this, ask for a room that doesn’t face the alley, or one on a higher floor. Also, be aware that overnight parking here is expensive – $62/night. That’s typical for downtown Chicago hotels, but still an added cost. I recommend using one of these parking apps to find a better deal if you drive into town. Room rates start at $109/night. Prices are higher in summer and fall, peaking at $299/night. That’s a bargain for a Michigan Avenue hotel, especially a new one which includes free breakfast and WiFi. Hampton Inns are part of the Hilton chain, so you can use Hilton Honors rewards points here. 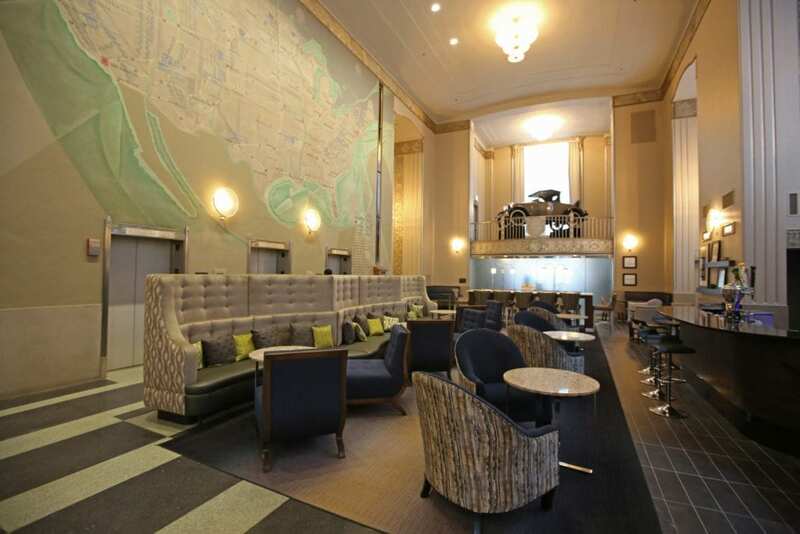 This Hampton Inn has things that no other hotels in this Hilton-owned chain has, including Art Deco decor, a historic feel, and a lobby bar, called Jack’s Place. The hotel also has my absolute favorite hotel feature – quiet-closing room doors! As a poor hotel sleeper, I hold this in very high regard. You will not wake up to the sound of slamming doors down the hall. The building, built in 1928, use to house the offices of the Chicago Motor Club. So that’s why there’s a car theme (and the original Art Deco decor) throughout. 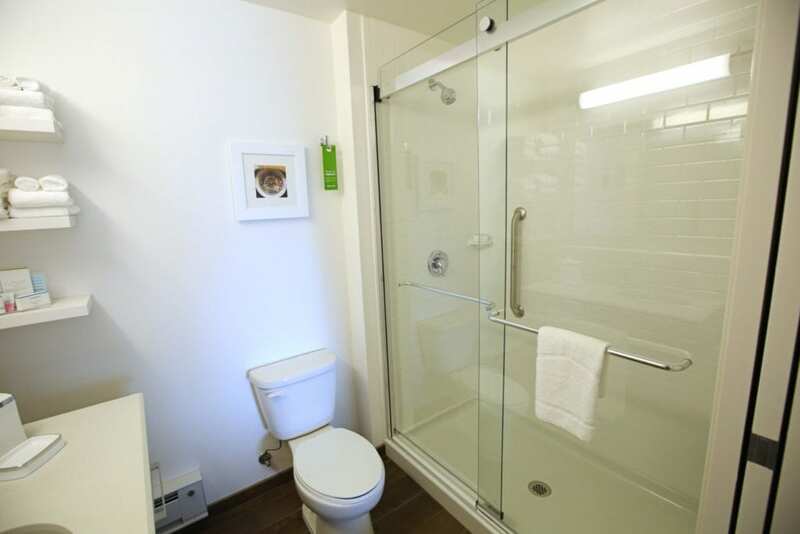 They’re clean, modern, and nicely appointed, but they are smaller than your typical hotel room. 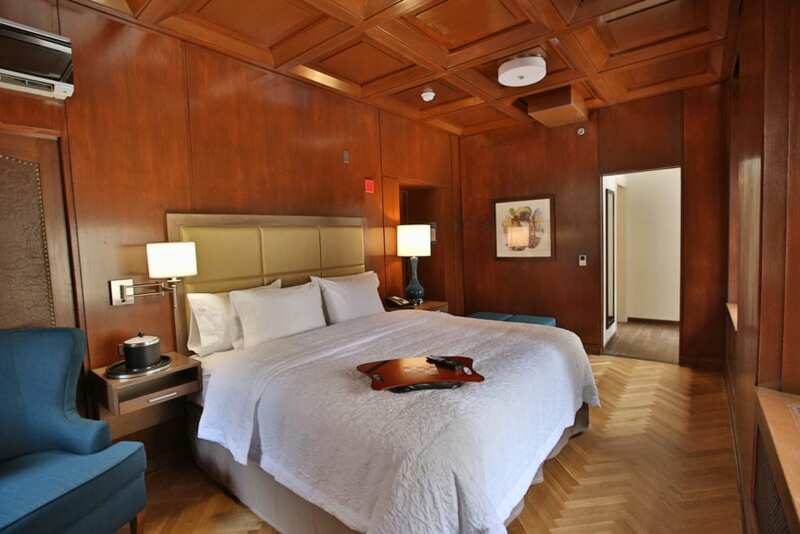 The hotel has three “historic rooms,” which are slightly larger, and have the original wood paneling and leather studded doors from the 1920s. They have comfy pillow-top beds with triple sheeting and down comforters. An acoustic guitarist plays during happy hour in the lobby bar, Jack’s Place, at the Hampton Inn Chicago Michigan Avenue. Their free breakfast buffet includes homemade waffles, scrambled eggs with (or without) ham, a selection of juices and fruits, and hot oatmeal with a selection of toppings. There are no on-site restaurants, although there’s a little shop next to the lobby that sells snacks 24 hours a day. At Jack’s Place Bar – one of only a few Hamptons in the country that serves alcohol – they serve the Chicago-made craft beer, Revolution, on tap. Morton’s Steakhouse, an expensive but delicious place for steaks, is across the street. Have you stayed at a Hampton Inn? Share your experience with us in the comment section below.